February 14 of each year is a special day in the world. It is the World Love Day, widely known as St Valentine. It is the day when men and women receive cards and gifts as a sign of passion and love. In Morocco, St Valentine is different. It is the first time ever Moroccans inside and outside the country gather in huge crowds to express their love and admiration, a love of a different kind. It is their passion for football. That day, Morocco was defeated by Tunisia (2-1) in the first exclusively Maghreban derby at the African Nations' Cup held in Tunisia between January 24 and February 14, 2004. Instead of feeling depressed for not winning the cup, all Moroccans went out in massive crowds in the main streets whistling and screaming with joy “we lost the cup, but we won a young prosperous team and a great coach”. To all Moroccans, this wasn't a defeat. 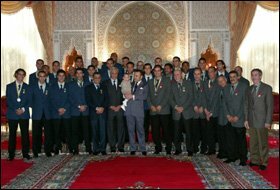 They agreed that the team's qualification to the CAN 2004 finals was itself a source of pride for all Moroccans and a reincarnation of Moroccan football after their 1976 victory, when they won the CAN Cup Championship. Analysts said that this year the Moroccan team played its best final. Their rival Tunisia has reached the final three times. Morocco was the first African country to qualify for the Euro-African World Cup elimination round in 1961; the first to qualify for a FIFA World Cup in Mexico in 1970; the first to reach the second round of FIFA World Cup in Mexico in 1986; the first to bid to host a FIFA World Cup in 1994; the first to referee a FIFA World Cup Championship final through its referee Said Belquola in 1998 in FIFA World Cup in France; and the first to participate in the World Club Championship through its Casablanca Raja team in 2000. It is true that Morocco team lost the African Nations' Cup, but won the hearts and support of all Moroccans. Cars hooted in the main streets of the Kingdom; a feeling of dedication, joy, patriotism, and a sense of belonging was seen in the happy faces of men, women, and children, who were holding Moroccan flags. Upon their arrival the following day at the Massira Airport in Agadir, the team was warmly welcomed by the local authorities and driven through the streets of the city in a bus, especially decorated for them with flowers, national flags, photos of the team, and pictures of the King. His Majesty King Mohammed VI paid tribute to the players and decorated them with the “Mokafaa Wataniya” officer rank distinction. The other team members were granted the “Al Arch Wissam” of the knight order. The Sovereign, who was accompanied by Crown Prince HRH Moulay El Hassan, posed for a picture with the entire team, and hosted a reception in their honour. The team went afterwards to Rabat where they were received by government members and a huge crowd of fans who were there to express their joy and thanks for the beautiful moments they had offered to Moroccans. The team had another meeting with their fans in Casablanca in Mohammed V Stadium, where a friendly derby between Wydad and Raja was played in their honour. The Moroccan people's spontaneous welcomes was an opportunity for the country to show the whole world how Moroccans are civilized, with a highly sporting spirit, and a passionate love for football. Many sports analysts said that “Tunisia won the CAN cup, and Morocco celebrated it with a highly sporting spirit”.